The same hall-effect sensor and brackets supplied in the RevMax and TJPro can be used to pickup the magnetic field from the stator of a Gas engine so you don't need to buy an extra pickup attachment. The mount shown below was made using the two supplied brackets. This configuration yields 1 pulse per revolution. The sensor should be orientated with the writing facing "away" from the engine. 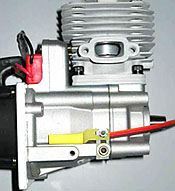 If the combination of a low rotor head speed and a low gear ratio(desired rotor head speed divided by gear ratio=engine rpm)causes the engine rpm to be under the lowest operating range of the TJ(9500rpm), 2 magnets installed in the fan will need to be used for a 2 pulse per revolution signal. You will need to orientate the writing on the sensor towards the magnet for this setup and verify that the red LED lights each time a magnet passes over the top of the sensor. This arrangement puts the TJ operating range to 4750-10250 engine rpm.